The Bible is quite clear. The only legitimate Jewish temple was to be in Jerusalem. Any other temple was illegitimate and a sign of heresy and apostasy. But have you heard about the Elephantine Jewish colony? Elephantine was a military fortress on the island in the Nile which was protecting Egypt’s southern border. A Jewish mercenary colony thrived there during the early Persian empire. We know about the Persian Elephantine from many documents - personal and diplomatic letters, business and wedding contracts, manumission of slaves, property deeds, even accounting sheets. These documents were unearthed from the late 19th through the early 20th century and they made their way into different libraries and museums around the world. A substantial collection of these documents is also kept in the Brooklyn museum. All these documents are collectively know as Elephantine Papyri and they offer an invaluable insight into the economic, legal and political life of people in Persian Egypt (around 400 BCE). Now, several diplomatic letters are about a Jewish temple in Elephantine and one letter requests from the Persian administrators a permission for the reconstruction of a Jewish temple of YHW (which is a variant spelling of YHWH) in Elephantine. The letters show that the original temple had stood in Elephantine for generations before it was destroyed by priests of the Egyptian god Khnum. We do not know whether the Elephantine Jewish temple was ever rebuilt, probably not. But regardless of the outcome, these documents attest to an active Jewish temple in South Egypt as late as the Persian period. And that is something you might not know about Biblical Judaism. This is actually quite a big deal because this Egyptian Jewish temple must had been in flagrant violation of the Biblical rules. Yet, the letters between Elephantine and Jewish authorities seemed supportive, collegial and harmonious. One explanation might be that the biblical rules about the centralization of the Jewish cult to Jerusalem were not enforced. A more radical alternative is that these centralization rules were not in place at that time and the book of Deuteronomy was not codified or even not yet written. And this broad unorthodox fluency of Jewish religion as late as the Persian period goes even further. An Elephantine papyrus mentions an oath-making in front of a divine couple Anat - YHW. YHW is a version of YHWH and Anat is a well documented Canaanite goddess. In the Ugaritic myths she is a passionate and violent partner of god Baal. Clearly, among at least some of the Jews in Elephantine Anat was a partner, a consort of YHWH. And that is another thing you might not know about Biblical Judaism. Why am I bothering you with this old dry scholarship? Because the more we know about our faith tradition, the better we can understand its broadness and better we can resist the dogmatic fundamentalism around us. The biblical testimony had been clearly just a narrow sliver of the real religious life and must be taken with respect but also with some latitude (just as it was clearly done by the ancient people). 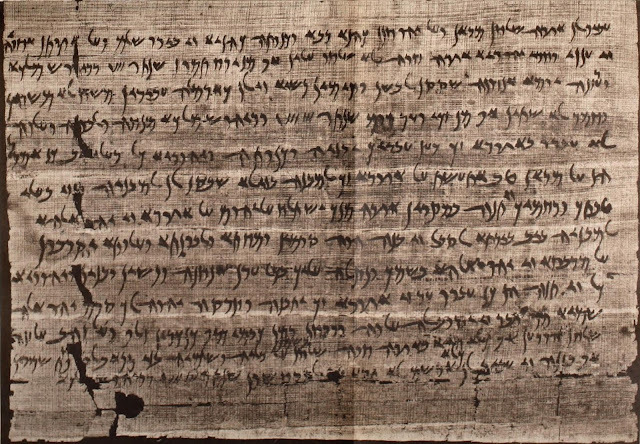 And here is a letter from Elephantine Jewish leader Yedoniah requesting permission to rebuild the Temple.